Christmas time, here at First Baptist Church is a busy and exciting time, not only for the children but the adults as well. Whether you like to consume tasty treats, make a joyful noise, enjoy other’s talents or give of yourself, we have it all. Read through the events and pick your pleasure, we look forward to celebrating the season with you. 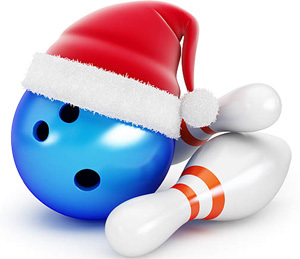 Sunday, November 25th at 1:00 p.m.
Bring the whole family to bowl, have fun and eat! We will also have laser tag available. The children will have their Christmas party while we are at the bowling alley. 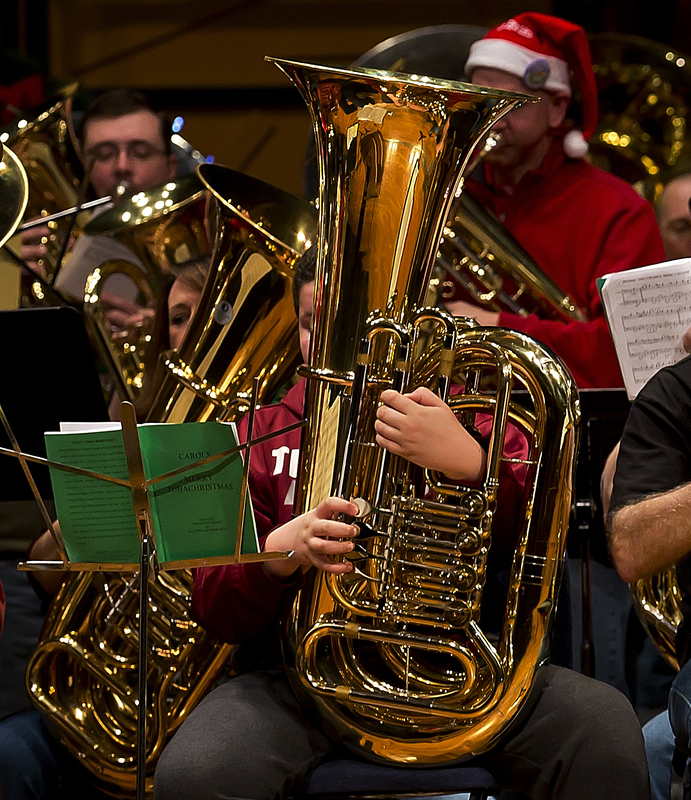 Sunday, November 25th at 5:30 p.m.
TubaChristmas is a music concert held in cities worldwide that celebrates those who play, teach, and compose music for instruments in the tuba family, including the tuba, sousaphone, baritone, and euphonium, though some participants bring rarer members of the family such as the helicon, ophicleide, serpent and double bell euphonium. The first TubaChristmas was organized by Harvey G. Phillips to honor his tuba teacher William Bell, who was born on Christmas Day 1902, and was held December 22, 1974, in the ice skating rink at New York City’s Rockefeller Center; Paul Lavalle conducted. Over 300 musicians played that day, beginning a holiday tradition. The arrangements of the Christmas carols were written by Alec Wilder, who coincidentally died on Christmas Eve 1980. We would love for you to join us in celebrating Christmas with our own Tuba Christmas which has become a family favorite tradition at FBC for several years. This is a free event open to all ages. Saturday, December 1st at 3:00 p.m.
Saturday, December 1st at 8:00 p.m. Praised on both sides of the Atlantic for their “visionary” approach, conductor Jeannette Sorrell and her actor-singers take Handel’s masterpiece back to its roots as a theatrical and spiritual journey. No one does Messiah like Apollo’s Fire! An inspiring holiday tradition. Tickets are available from $10 to $77. These spectacular performances will be in our sanctuary. Saturday, December 8th at 3:00 p.m.
Saturday, December 8th at 8:00 p.m. The program that premiered in 5 sold-out concerts last year returns in a lively new version. Fiddlers, singers, hammered dulcimer, bagpipes, and a whistle-playing dancer join with children’s voices to evoke the Celtic roots of an Appalachian Christmas. The people of the mountains welcome Christmas with LOVE, SINGING, DANCING and PRAYER. Tickets are available from $10-$77. Come and share this beautiful music with us in the sanctuary. 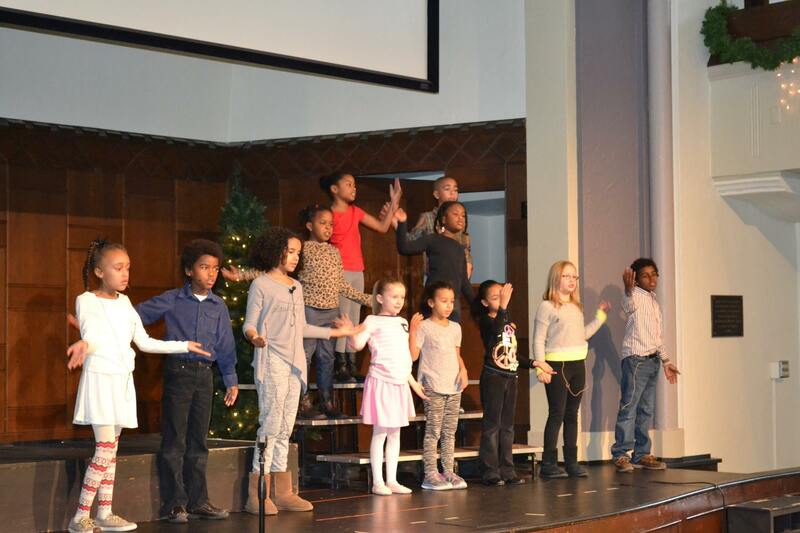 Stay after church for our children’s Christmas production. 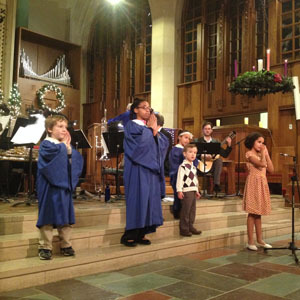 It’s a Crazy, Buzy, Peaceful, Holy Night – A Christmas Musical for Kids. Refreshments will be served following the program which will be performed in Spahr Center. (A great service for the whole church! Whether you do or don’t have a child in the program, we gather to support and love our children during the Christmas season.) This a free event open to all ages. 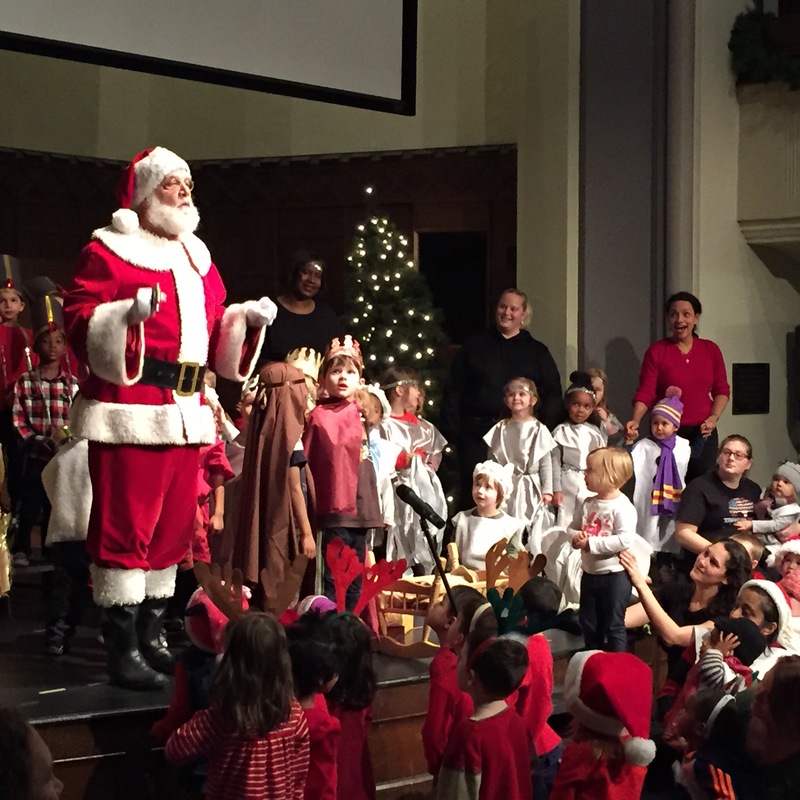 Children and parents from the Children’s Center will gather in the sanctuary so each classroom can sing some of their Christmas favorites. This is free and open to everyone with Christmas Spirit! There will be light refreshments for all and something sweet for the kids from St. Nick. Saturday, December 15th from 10:00 a.m. – 3:00 p.m. 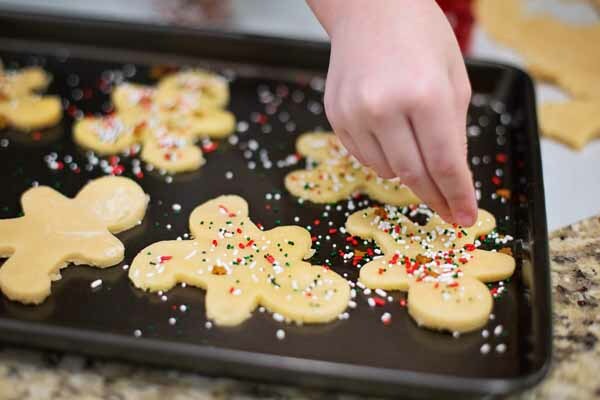 The children take over the kitchen downstairs to create their masterpiece in the form of Christmas cookies. These sweet sensations are a holiday favorite. They will get together in the Bell dining room to perfect their decorating skills. This a free event that is open to all ages. Sunday, December 16th at 4:00-6:00 p.m., prelude music begins at 3:40 p.m. The Festival of Lessons and Carols is a service of Christian worship celebrating the birth of Jesus that is traditionally followed at Christmas. The story of the fall of humanity, the promise of the Messiah, and the birth of Jesus is told in nine short Bible readings from Genesis, the prophetic books and the Gospels, interspersed with the singing of Christmas carols, hymns and choir music. The first Festival of Nine Lessons and Carols at King’s College, Cambridge, was held on Christmas Eve in 1918. It was introduced by Eric Milner-White, the Dean of the College, whose experience as an army chaplain had led him to believe that more imaginative worship was needed by the Church of England. The order of service was adapted from the order created by Benson for Truro Cathedral 38 years earlier, which was based on an idea of George Walpole, at the time Succentor of Truro Cathedral, and the future Bishop of Edinburgh. The first service at King’s largely followed Benson’s original plan, including the Benedictions before each reading, several of which were later amalgamated by Milner-White into his Bidding Prayer. The music at the first service at King’s was directed by Arthur Henry Mann, who was the organist from 1876 to 1929. The choir had 16 trebles as specified in statutes laid down by Henry VI, and until 1927 the men’s voices were provided by choral scholars and lay clerks. 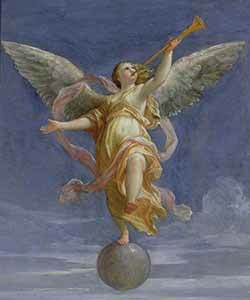 Today, 14 undergraduates from the Choir of King’s College, Cambridge, sing the men’s parts. Our festival is free and open to all ages to join us in the sanctuary. 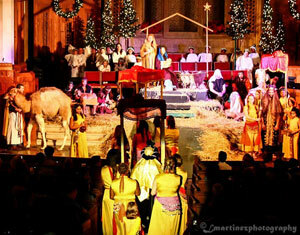 Monday, December 24th at 7:00 p.m.
One of First Baptist Church’s most beloved annual traditions, our living nativity brings to life the Christmas story into our sanctuary with a large host of live animals, choirs, soloists, musicians and the newborn baby Jesus. The church sanctuary fills up as we celebrate with traditional hymns and new selections of music, as we participate together in the celebration of the birth of Jesus. Children and adults alike will enjoy this free event. 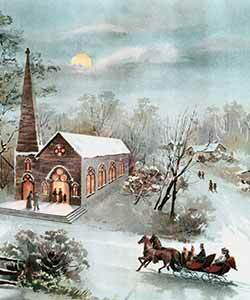 Monday, December 24th at 11:00 p.m.
Another long-standing tradition of the church has been the spirit of peace on earth, goodwill to humanity on the eve of Christ’s birth. 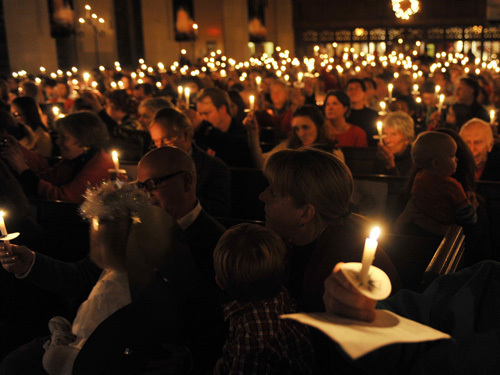 Enjoy the beautiful music, remember the true meaning of Christmas through this wonderful service that ends with the sanctuary aglow with the light of candles and the hush of the congregation united singing Silent Night. The free service is open to all ages and ends near the midnight hour as we welcome in Christmas Day in our church home. Get more answers about our Christmas events.